Hi, I am a software engineer, road cyclist and astrophotographer living in Espoo, Finland, and working for the Intel Open Source Technology Centre. Starting this year, I thought I would also write about my cycling, since it has been taking a bigger and bigger part of my life lately. 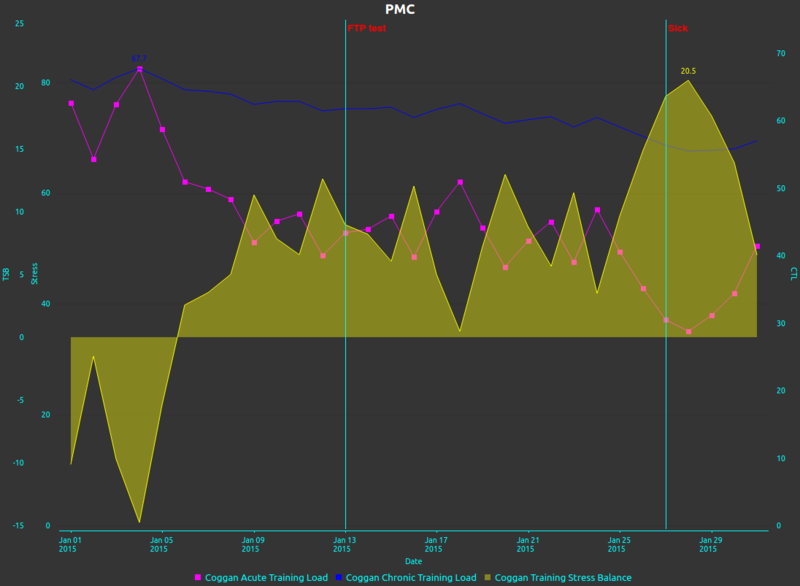 As I just started this new section, I will shortly summarize my previous twenty months of cycling. 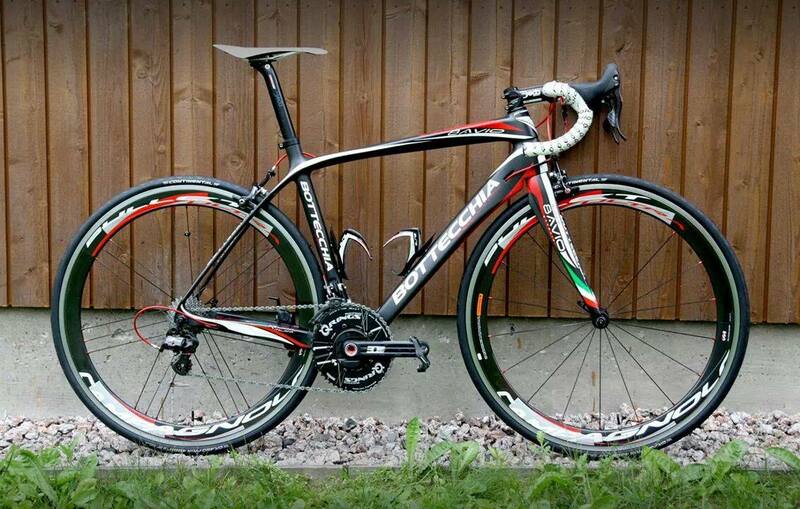 Back in May 2013 I got my first road bike, and from then on I could not get enough of the sport. I have been riding up and down Mt. Grappa at every chance I have had to be in Italy, and I have amassed a respactable amount of kilometers since. I closed off 2013 with 5,000 km in the bank, and 2014 with 11,300 km. I have since changed to a different bike, a Bottecchia Super Ottavio with Campagnolo Super Record, and in June 2014 I got a power meter so I could train with the best possible tools and monitor my progress scientifically. So let us now get to the month at hand for a quick retrospective analysis. After two months and a half of base and SST training to work on my aerobic engine during the late fall and early winter, the second half of January was finally the time to start with build blocks, in order to try and be ready and in good form come Spring. Unfortunately, though, a flu got in the way after the first week of my build block, compromising my second and third weeks. I managed to savage something, getting 278 TSS done on week 2, and 306 on week 3. 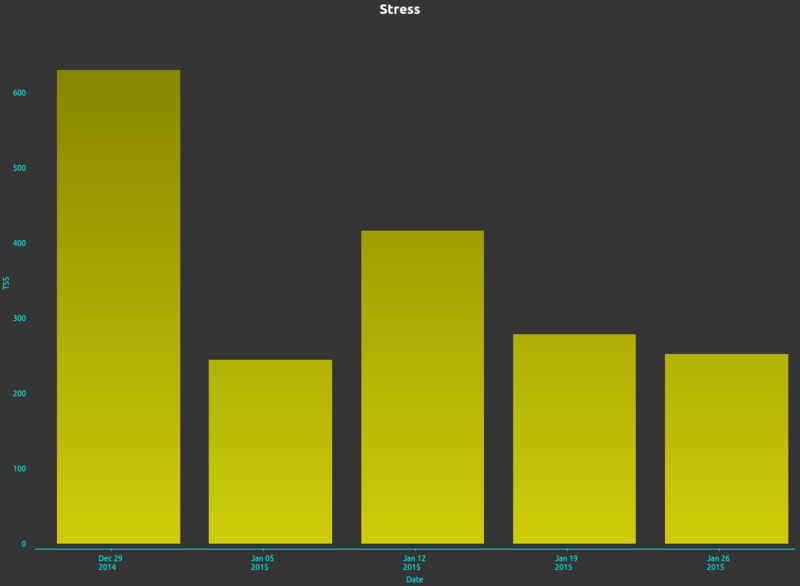 In theory you should increase your TSS week after week, up until your recovery week when you do about 50% of your average TSS in your previous weeks, so now I am left with a monstrously positive TSB and the need to start the build block from the beginning. It sounds incredible, but being literally only four days sick made me lose two whole weeks of training stress and subsequent adaptations. 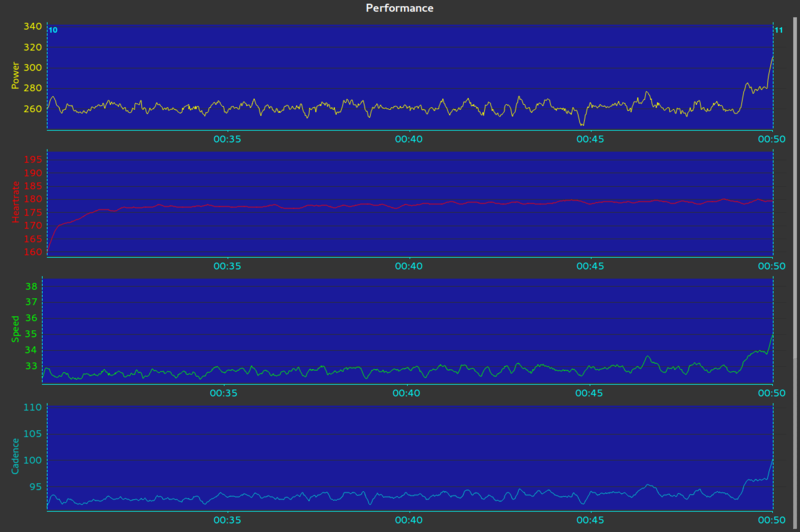 Anyway, January was a good month because it saw my best ever 20-minute power, at 262 watts. I currently weigh 61.5 kg, which is a 1.5 kg gain from my summer / race day weight, but I am pretty sure I will lose that in April and May while keeping (and hopefully increasing) my power at threshold. This means that my W/kg is currently at 4.04, with the potential of being at 4.15. And I know I can squeeze a few more watts out of these legs if I pace myself even better. During my last 20-minute test I had some juice left at the end to finish strong, so I will go for a steady 270 W next time. 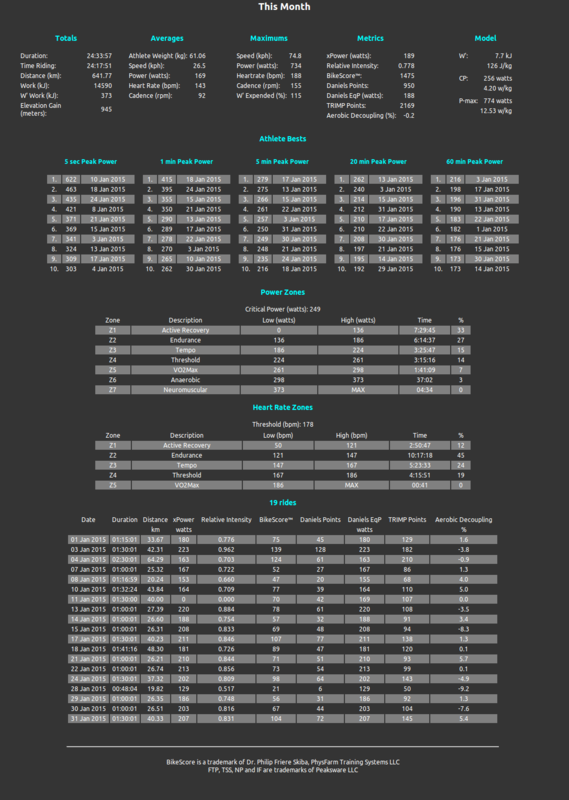 To wrap things up, here is a summary page of the month. From February on, I will try to increase the hours a little, getting closer to 30 hours a month, while keeping my gym regimen one to two times a week. 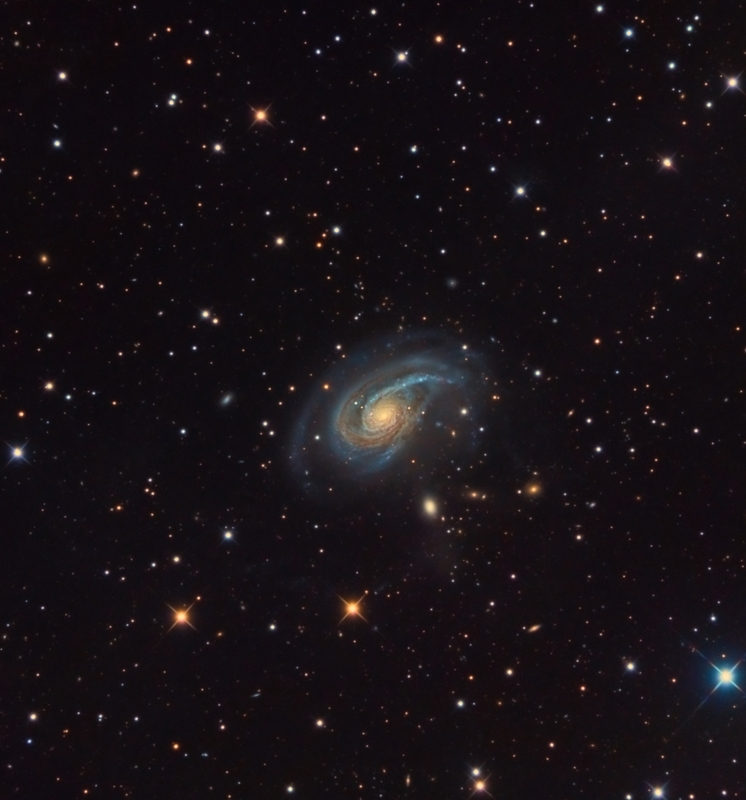 This image of the unbarred spiral galaxy NGC 2976 ends a very proficuous 2014, and it was imaged by the observatory shared between me and Samuel Diaz between December 18th and December 22nd. About 28 hours went into it, to properly highlight the rather conspicuous Integrated Flux Nebula. The galaxy, that lies in the M 81 group some 11.6 million light-years away, is classified as a SA though its spiral arms are difficult to be traced. Maybe with some imagination you can see them, but the stellar matter in my picture just looks like a messy bulk. 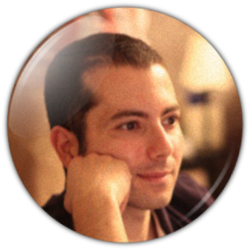 The image can be seen on AstroBin too, of course, here. 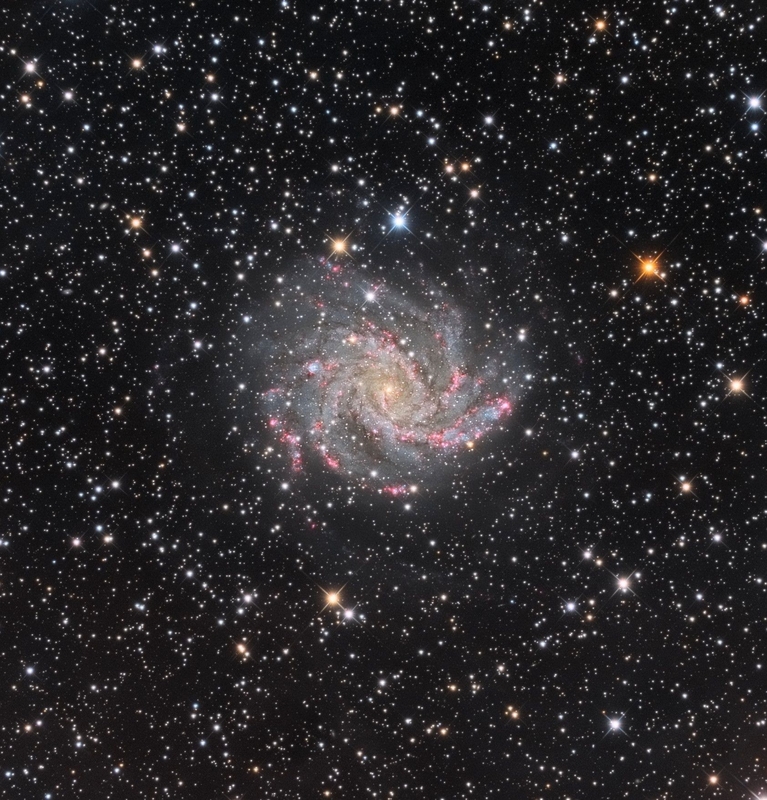 Another beatiful and peculiar galaxy shot from the dark and remote skies of Nerpio, Spain, using the setup shared with Samuel Diaz, a GSO 12-inch RC reflector, and an Atik 4000 CCD on top of a Paramount MX mount. Arp 78 is an unbarred spiral galaxy approximately 130 million light-years away in the constellation Aries. Around 200,000 light years in diameter, it is twice the size of the Milky Way Galaxy, and is surrounded by several satellite galaxies – including the dwarf elliptical, NGC 770 – whose tidal forces on the larger galaxy have likely caused the emergence of a single elongated outer spiral arm that is much more developed than the others arms. Halton Arp described it as a “Spiral galaxy with a small high-surface brightness companion”. Two supernovae (SN 2003 hl & SN 2003 iq) have been observed in Arp 78. Arp 78 probably has a H II nucleus, but it may be a transitional object. 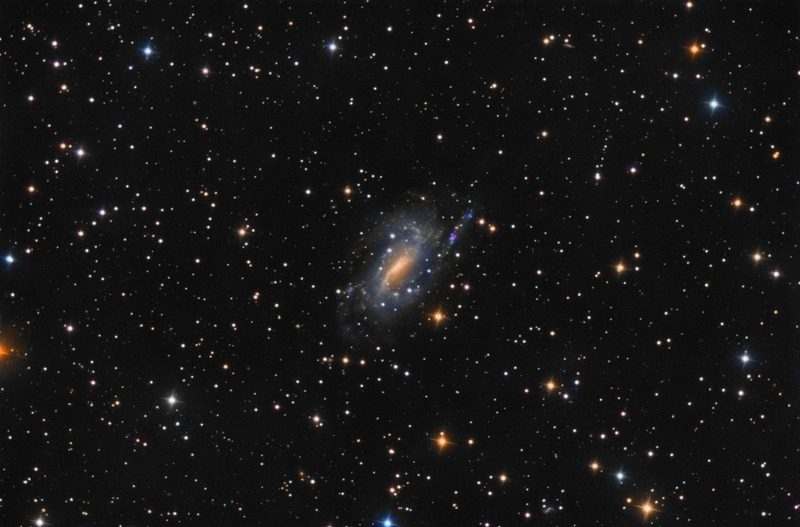 Catching up on my backlog of images to postprocess, here I present NGC 1530, a barred spiral galaxy in Camelopardalis. I am not too happy with the processing this time, obviously because I am getting quite rusty. I know that this galaxy has some very active and Hα rich areas along its spiral arms, but they do not show up in my processing. Samuel’s version, on the other hand, shows more than a hint of that, so perhaps I should ask him how he brought that out. The sky background shows some subtle suggestions of the integrated flux nebula, but it might as well be that we need to better calibrate our light frames. Here’s a long due bundle of my recent astrophotography. More details can be found on my AstroBin page. The last few months have been pretty busy, with my daughter growing up, plenty of road cycling (10,000 km in 2014 so far), work, and a couple of side projects, but though it’s a cliché to say so, I hope I can update these pages more often, in the future. After some silence, I’m returning to deep sky imaging with this image of the Arp 84 galactical complex. A new setup, a joint project between me, Samuel Díaz Lopéz, and Jaime Alemany, was a bit tricky to get in order. Things are exacerbated by an order of magnitude because of the remote location of the observatory, and it took several trips to get things usable. The observatory now hosts a GSO RC12 Truss telescope on a Paramount MX mount. Samuel’s Atik 4000 CCD is still operational, because of some trouble setting up Jaime’s QHY22. Anyway, after a few troubled months, we were able to collect enough data for the first official light. 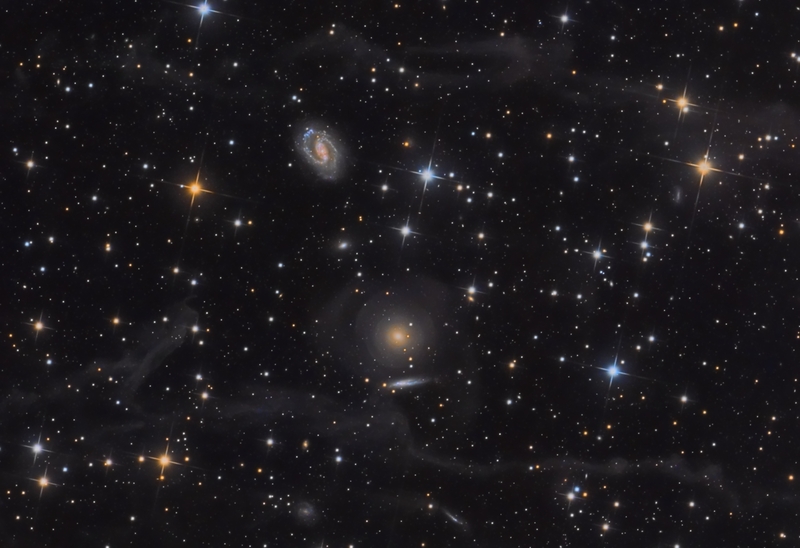 The image you see above (just a crop, click through for the full field) depicts Arp 84, the galactical interaction of NGC 5395 and NGC 5394. The cosmic collision is in the constellation of Canes Vanatici, and approximately 55 milion parsecs away. A bit over twelve hours were put into the collection of photons. The image featured here is the fruit of my labour with PixInsight and The Gimp. 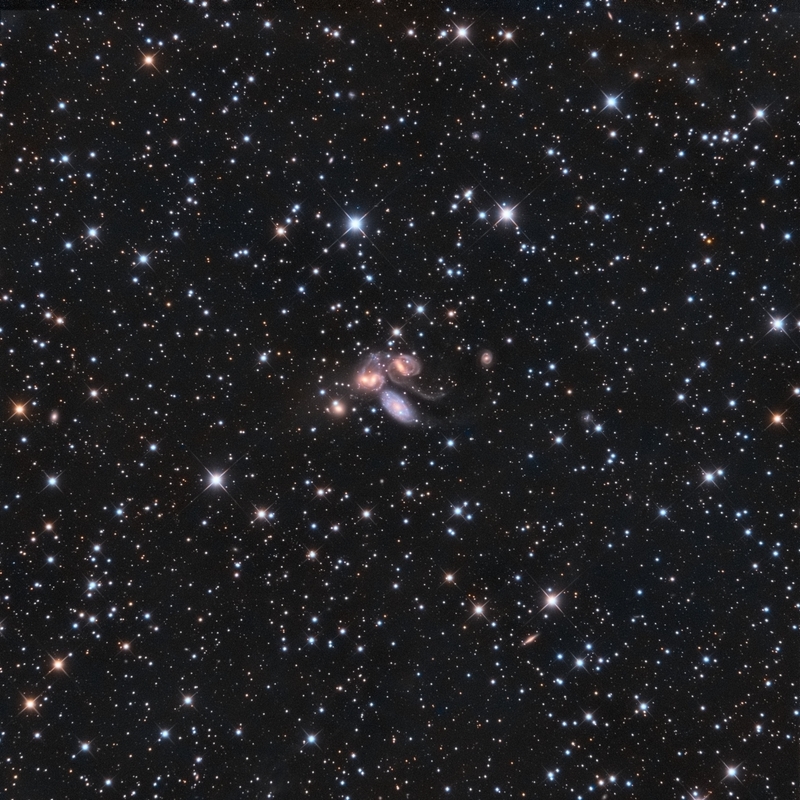 A proficuous Autumn has gifted Samuel and me of many clear nights, so I am able to share once again a deep image of two nice galaxies with background wisps of Integrated Flux Nebula. 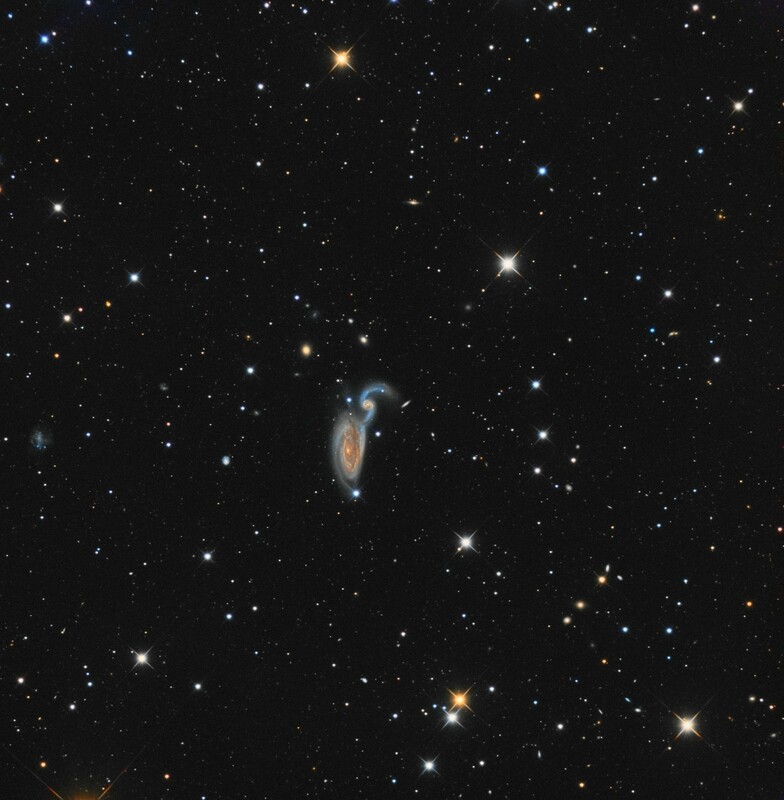 NGC 2633 (mag 12) and 2634 (mag 11.8) are two galaxies in the constellation of Camelopardalis (also known as the Giraffe), each about 2’ across in apparent size. The entire field is permeated by the Integrated Flux Nebula, which is well visible in a structure of two definite wisps. Samuel’s version of this image shows a larger field and a greater extension of the filaments. I have found traces of the IFN on other images of this fields, but this is the one where they are the most obvious. 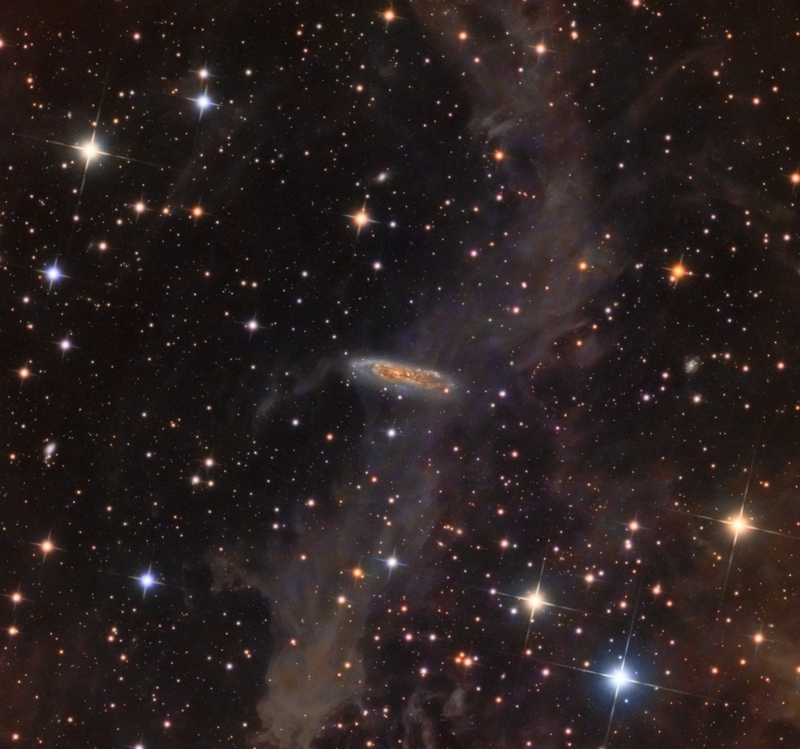 The image is also available on AstroBin: NGC2633-34 and wisps of IFN on AstroBin. Across the end of November and the beginning of December 2013, Samuel and I have collaborated on another nice project. I’m really taking a liking for galaxies with nearby dust, whether it be the Integrated Flux Nebula in our Milky Way, or some extragalctic residual of gravitational interaction. 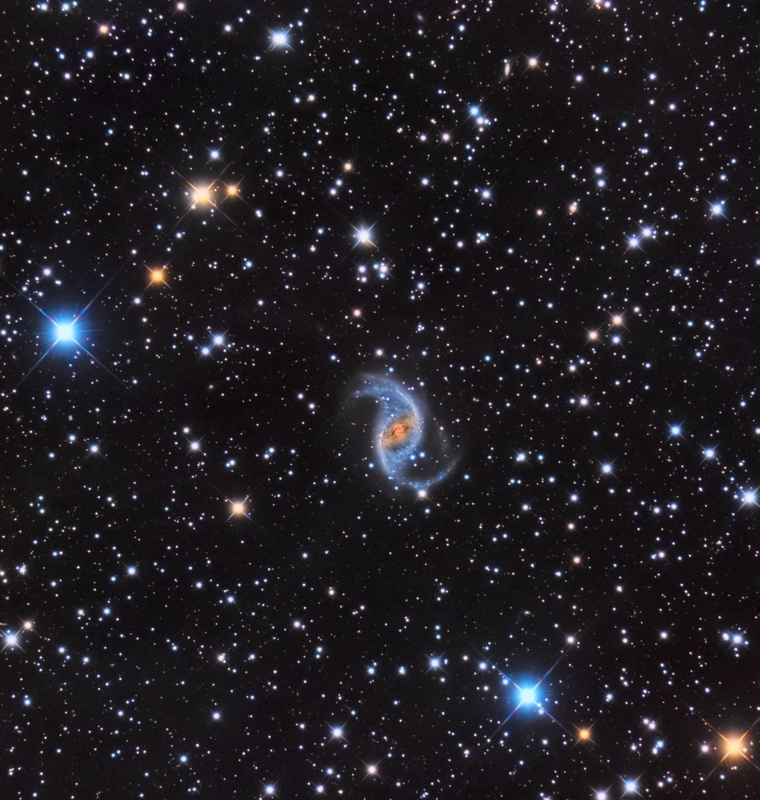 The image can be seen on AstroBin as well: NGC 7496 and dust on AstroBin. 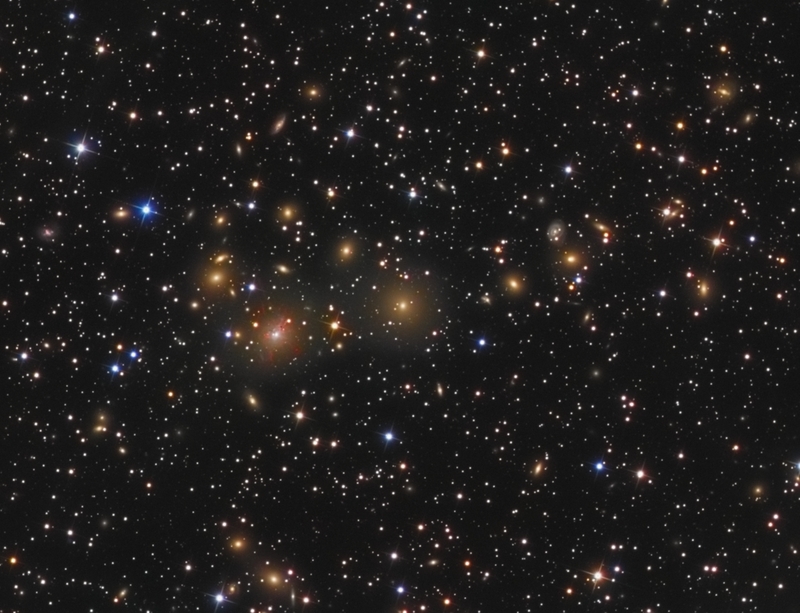 At the end of November 2013, Samuel and I have turned our telescopes towards the Abell 426 galaxy cluster in Perseus. The image can be seen on AstroBin as well: Abell 426 on AstroBin. 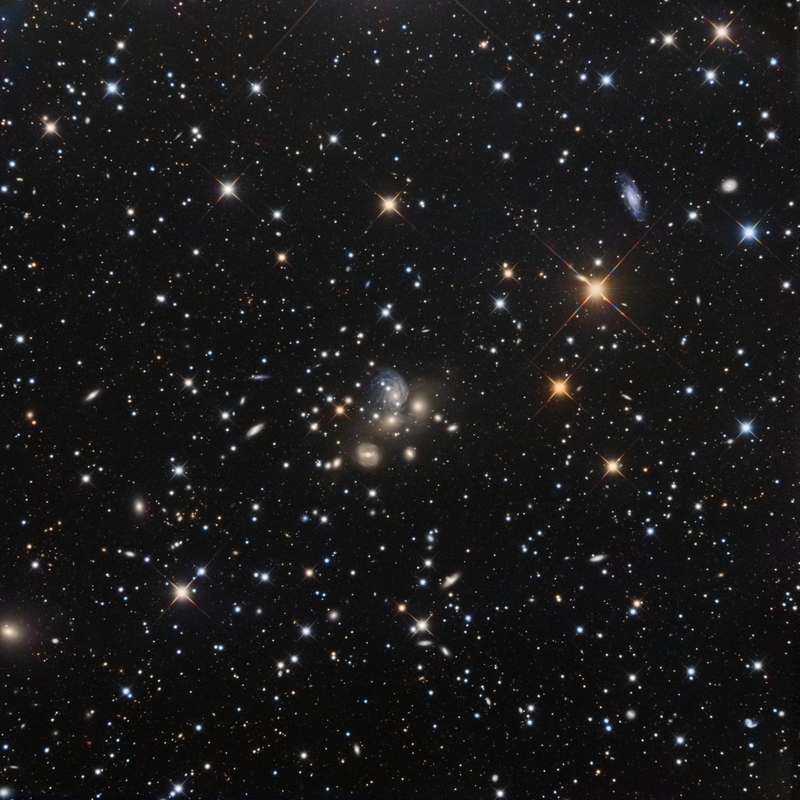 From Wikipedia: The Perseus Cluster (Abell 426) is a cluster of galaxies in the constellation Perseus. It has a recession speed of 5,366 km/s and a diameter of 863’. It is one of the most massive objects in the universe, containing thousands of galaxies immersed in a vast cloud of multimillion degree gas. Having been outrageously busy with AstroBin from mid September up to the time of writing, I literally had no time to process the most recent batches of subframes I’d been collecting. At some point I didn’t even have the time to acquire any subs at all, because due to the change to DST, my mount went out of alignment somehow. Anyway, I can finally enjoy some respite, so let me present the most recent images I’ve taken. 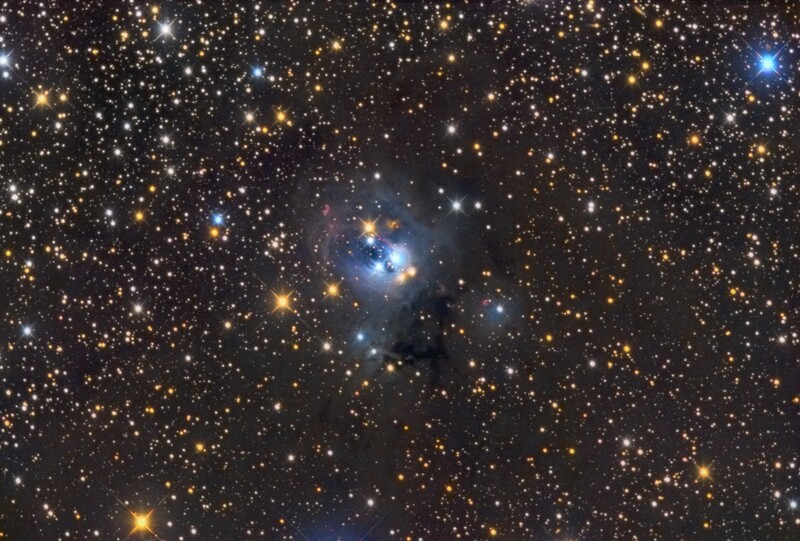 NGC 7129 is a reflection nebula located 3,300 light years away in the constellation Cepheus. A young open cluster is responsible for illuminating the surrounding nebula. A recent survey indicates the cluster contains more than 130 stars less than 1 million years old. NGC 7129 is located just half a degree from nearby cluster NGC 7142. The nebula is rosebud-shaped; the young stars have blown a large, oddly shaped bubble in the molecular cloud that once surrounded them at their birth. The rosy pink color comes from glowing dust grains on the surface of the bubble being heated by the intense light from the young stars within. The ultra-violet and visible light produced by the young stars is absorbed by the surrounding dust grains. They are heated by this process and release the energy at longer infrared wavelengths as photographed by the Spitzer Space Telescope. The reddish colors in the false-colour infrared image suggest the distribution of hydrocarbon rich molecular material. The much cooler molecular cloud outside the bubble is mostly invisible to Spitzer. However, three very young stars near the center of the nebula are sending jets of supersonic gas into the cloud. The collision of these jets heats carbon monoxide molecules in the nebula. This produces the complex nebulosity that appears like a stem of a rosebud. 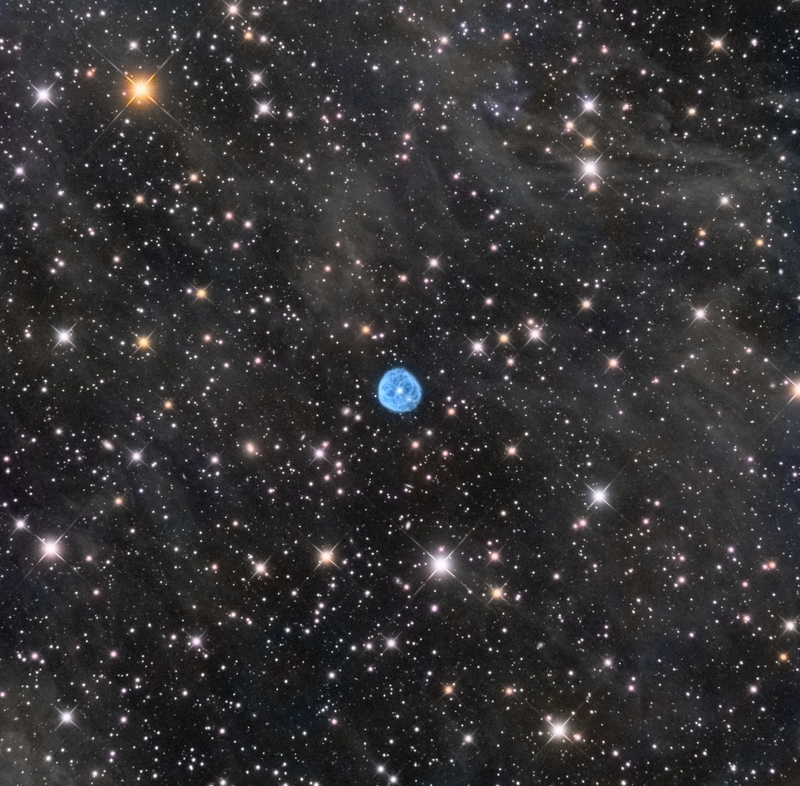 The image is of Sharpless 2-188, an unusual planetary nebula located in the constellation Cassiopeia. The expanding gas from the planetary nebula is colliding with ambient gas in the interstellar medium. The nebula is nearly circular in shape but is much brighter to the southeast (lower left) because the central star is moving rapidly in that direction. Faint wisps of gas can also be seen in the opposite direction. NGC 7217 is a gas-poor system whose main features are the presence of several rings of stars concentric to its nucleus: three main ones -being the outermost one the most prominent and the one that features most of the gas and star formation of this galaxy-, plus several others inside the innermost one discovered with the help of the Hubble Space Telescope, a feature that suggests NGC 7217’s central regions have suffered several starbursts, and a very large and massive spheroid that extends beyond its disk. 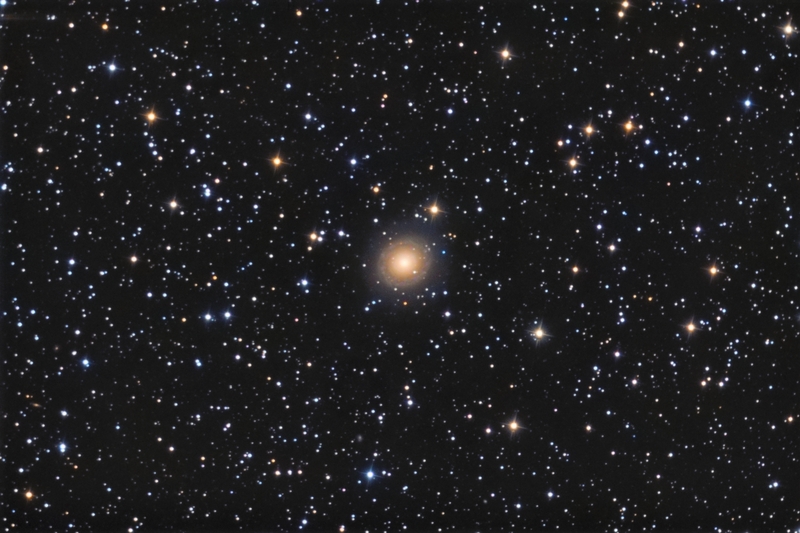 Other noteworthy features this galaxy has are the presence of a number of stars rotating in the opposite direction around the galaxy’s center to most of them and two distinct stellar populations: one of intermediate age on its innermost regions and a younger, metal-poor on its outermost ones. 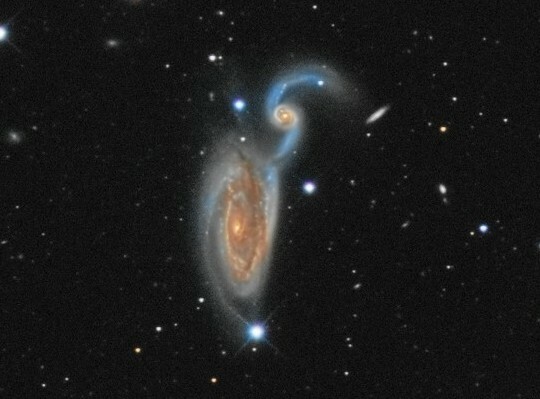 It has been suggested these features were caused by a merger with another galaxy and, in fact, computer simulations show that NGC 7217 could have been a large lenticular galaxy that merged with one or two smaller gas-rich ones of late Hubble type becoming the spiral galaxy we see today; however right now this galaxy is isolated in space, with no nearby major companions. 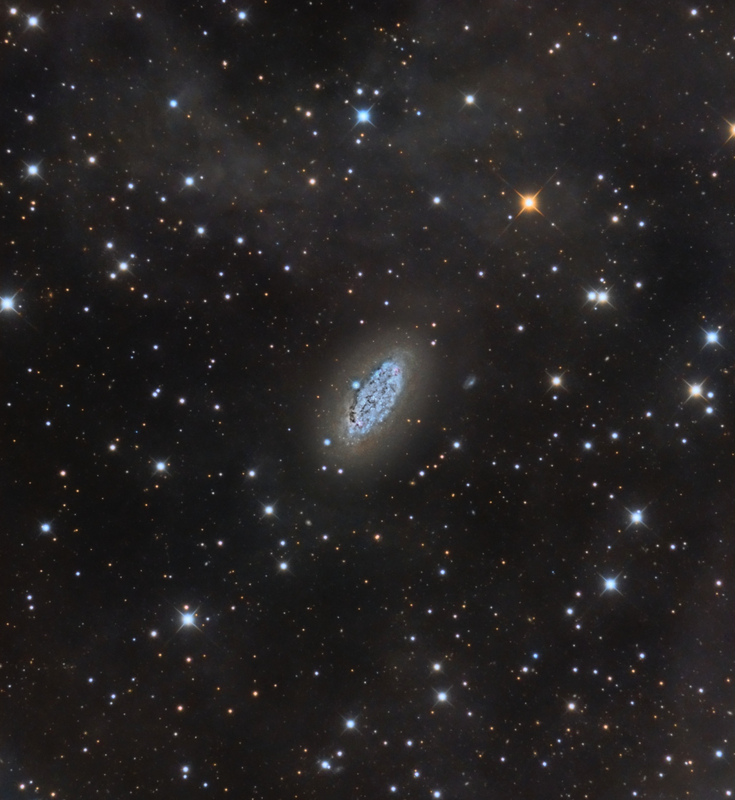 NGC 925 is a barred spiral galaxy located about 30 million light-years away in the constellation Triangulum. The morphological classification of this galaxy is SB(s)d, which indicates that this has a bar structure and loosely wound spiral arms with no ring. The spiral arm to the south is stronger than the northern arm, with the latter appearing flocculent and less coherent. The bar is offset from the center of the galaxy and is the site of star formation all along its length. Both of these morphological traits — a dominant spiral arm and the offset bars — are typically characteristics of a Magellanic spiral galaxy. The galaxy is inclined at an angle of 55° to the line of sight along a position angle of 102°. This galaxy is a member of the NGC 1023 Group, a nearby, gravitationally-bound group of galaxies associated with NGC 1023. 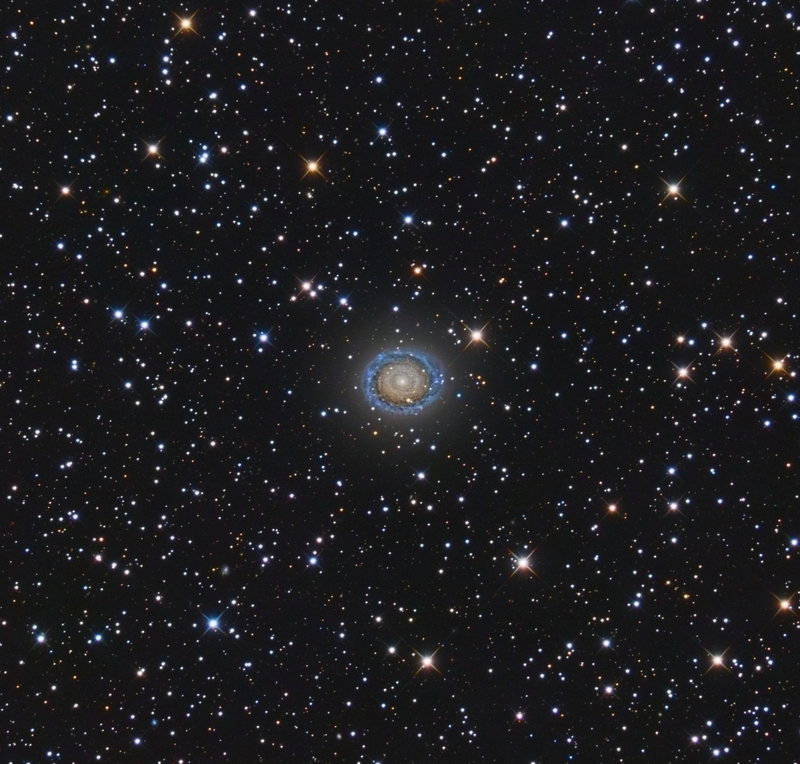 However, the nearest member lies at least 650 kly (200 kpc) distant from NGC 925. 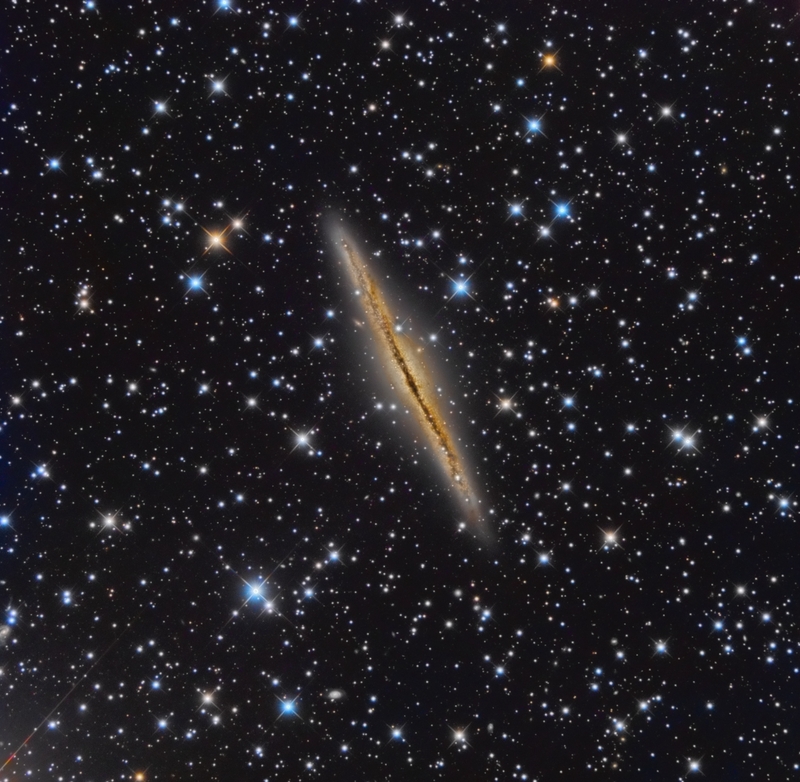 There is a 10 million solar mass cloud of neutral hydrogen attached to NGC 925 by a streamer. It is uncertain whether this is a satellite dwarf galaxy, the remnant of a past tidal interaction, or a cloud of primordial gas. This image was acquired in conjunction with Samuel Díaz. 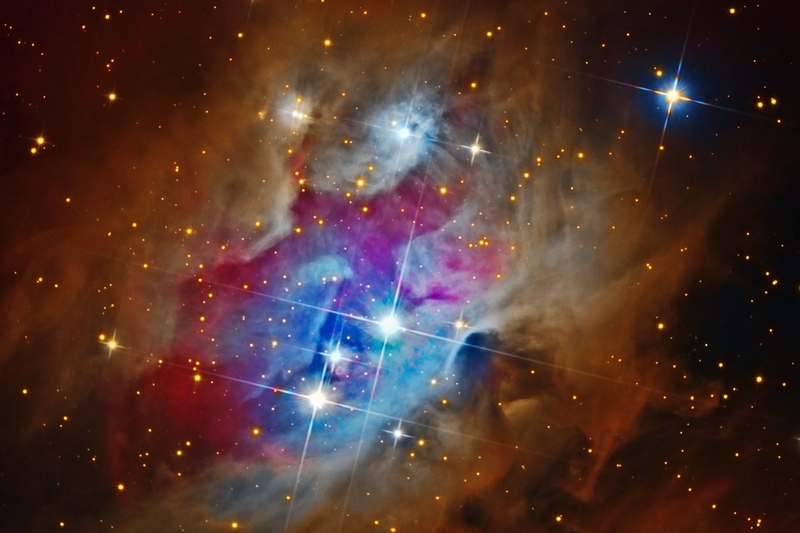 NGC 1973/5/7 is a reflection nebula 1/2 degree northeast of the Orion Nebula. The three NGC objects are divided by darker regions. 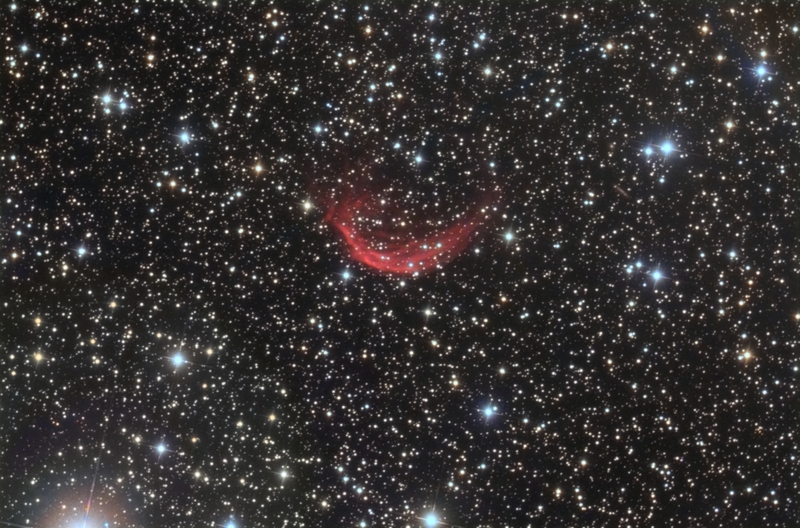 It is also called The Running Man Nebula and Sharpless Catalog 279. 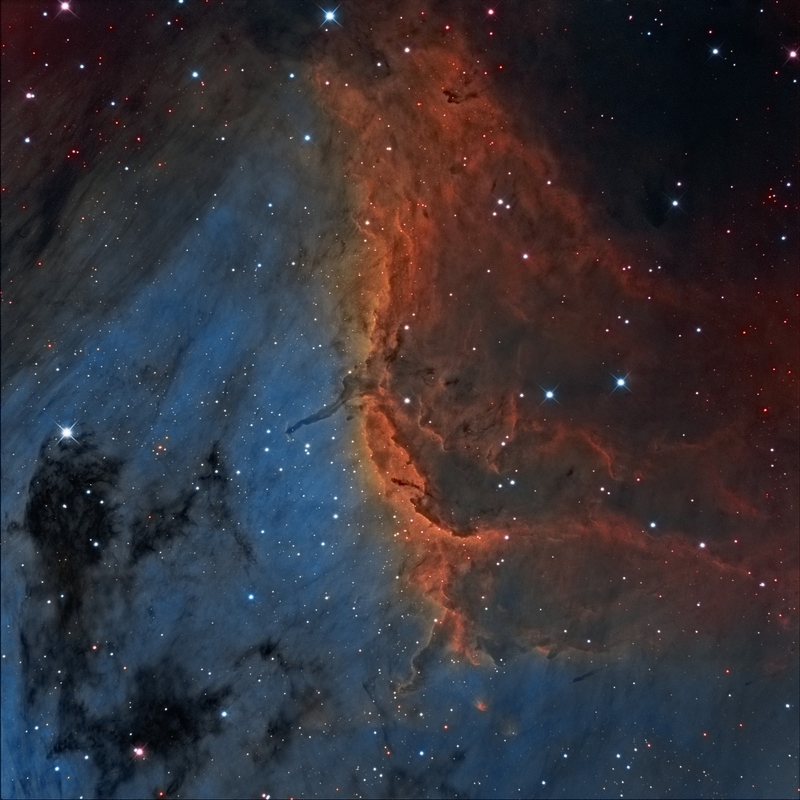 This object was named ‘The Running Man Nebula’ by Texas Astronomical Society member Jason Ware. Approximately 20 years ago his downstairs neighbor looked at the object and said it looked like a running man. He brought this up a TAS club meeting and the name stuck. Now widely accepted as ‘The Running Man’.